Click the SmartArt graphic (read: Create a SmartArt graphic) that you want to animate. On the Animations tab, in the Animations group, select the animation that you want from the Animate list. When you animate your SmartArt graphic, depending on the layout that you use, you can choose from among the following options. As one object : The animation is applied as though the entire SmartArt graphic is one large picture or object (object: A table, chart, graphic, equation, or other form of information. 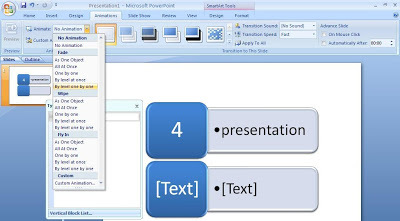 Objects created in one application, for example spreadsheets, and linked or embedded in another application are OLE objects.). All at once : All of the shapes in the SmartArt graphic are animated at the same time. The difference between this animation and As one object is most notable in animations where the shapes rotate or grow. With All at once, each shape rotates or grows individually. With As one object, the entire SmartArt graphic rotates or grows. One by one : Each shape is animated individually, one after the other. By branch one by one : All of the shapes in the same branch are animated at the same time. This animation works well with branches of an organization chart or a hierarchy layout and is similar to One by one. By level at once : All shapes at the same level are animated at the same time. 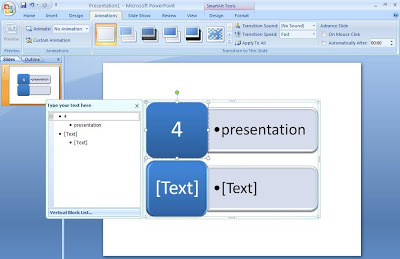 For example, if you have a layout with three shapes that contain Level 1 text and three shapes that contain Level 2 text, the three shapes that contain Level 1 text are animated together first, and then the three shapes that contain Level 2 text are animated together. By level one by one : The shapes in the SmartArt graphic are animated first by level and then individually within that level. 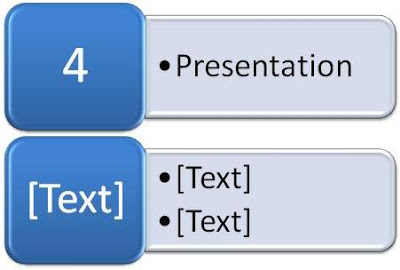 For example, if you have a layout with four shapes that contain Level 1 text and three shapes that contain Level 2 text, each of the four shapes that contain Level 1 text are animated individually first, and then each of the three shapes that contain Level 2 text are animated individually.